Ohai. I dropped off the face of the earth for a little while, there. Not really, but I did go to Disney World with a now-four (!) year old for his birthday. Can I make it up to you with some goodies? Betty Crocker sent me this pack through My Blog Spark and it’s pretty fantastic. The Yankee loves him some instant mashed potatoes so he was quite pleased. My favorite thing to do with them? Use the roasted garlic flavor for making these yeast rolls — voila, roasted garlic bread! Who’s up for your own prize pack? 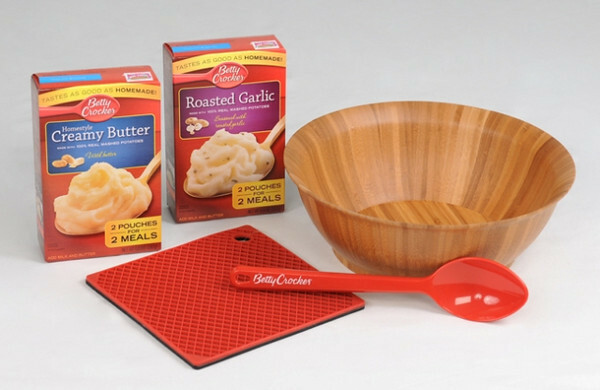 My Blog Spark will send you two boxes of Betty Crocker Boxed Instant Mashed Potatoes (one Roasted Garlic and one Homestyle Creamy Butter), a serving bowl, a trivet and a serving spoon. All you have to do is leave a comment telling me how you like your mashed potatoes. As-is? With lots of butter? Cheese? Chives? Lay it on me. I’ll pick a winner via Random.org after midnight, Tuesday the 21st of December. I use sour cream instead of butter in my mashed potatoes and add parsley to them. It comes out very creamy! Yum, yum potatoes! I love my mashed potatoes with lots and lots of blue cheese! Yummmm, mashed potatoes! I take the instant and keep it to salt for the kiddos and hub, then douse my portion with lemon pepper. Everybody’s happy! I like the real deal with butter and sour cream. Adding cheese sounds like a good idea! I love mashed potatoes with LOTS of butter and salt. Yum! I love them just about any way except with bacon or ham in them–I hate when people sneak that it! But I prefer just butter, salt and pepper usually. Mashed potatoes are good most any way!! My Mother-in -law made the BEST mashed potatoes, she used a hand masher , lots of butter ,warm milk and the whipped them with a wooden spoon!! They were perfect!! I love mashed potatoes with roasted garlic. Also, I like the red skin potatoes in it. Butter, salt, cream…if we’re going traditional. To be a little more adventurous: cottage cheese and bacon with a little sugar-weird but tasty! I LOVE mashed potatoes! Lots of butter, some milk, salt & pepper..it’s like getting a big hug!! I love my mashed potatoes with roasted garlic! And some butter, of course! I love my mashed potatoes with lots of butter and lots more cheese! The cheesier the better! Butter, butter, and more butter. I make my mashed potatoes with lots of sour cream and butter and are they ever yummy!